If this movie didn’t have Bela Lugosi in it, it would probably have disappeared long ago. Lucky for it, Lugosi plays a central albeit only functional role, so it is sure to be viewed at least once by anyone looking for lesser known Lugosi films, or old horror films in general. That one viewing, though, is probably all it will get from most people who do give it a chance. 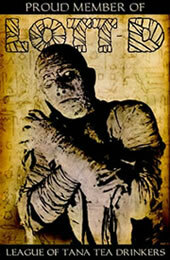 The Devil Bat is a generic yet charming piece of classic horror, good for casual viewing. The title and the main role seem to suggest a vampire flick, but it literally is about a bat—a bat that has been enlarged by the literally mad scientist Dr. Carruthers and trained to attack and kill, with a chillingly unnatural scream, anyone wearing the doctor’s new aftershave. The viewer is shown all that is happening, but the town is confused by these strange killings. In order to capitalize on the events, two reporters, Johnny Layton and his cameraman, One-shot McGuire (I’m not kidding), set out to solve the case. 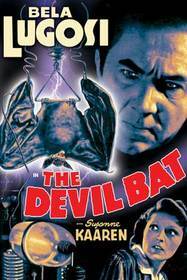 This movie is not big on insight or scares, unless, perhaps, you were born in the 1920s, and the Devil Bat does not look even slightly realistic other than in its close-ups, in which a real bat is used, but there is something charming about it all. Certainly Lugosi’s presence is partly responsible for this. In this film, you can gauge a character’s importance, or rather the importance the writers wanted them to have, by the quality of lines they are given, and he is given some good ones. The reporters do beat him out, though, and the prize has to go to Layton with this maverick statement: “Not so funny when it’s your own jugular vein that’s in danger, is it, Doc?” This would be something of an overhaul, but it seems the movie would have been much more fun if the focus was moved more toward Dr. Carruthers. As I said, he mostly just repeats the same actions. After all, why put Lugosi in your film if you’re going to use him only as a charismatic plot device? If you’re having trouble finding a movie for your Netflix queue, or if you have an affinity for Lugosi or 1940s horror in general, check this one out. It’s a fun little film that you probably won’t watch more than once, but you likely won’t regret the sixty-eight minutes you spent.